Getting there: From the center of Big Bend proceed south west on the Alpine road follow directions that point you toward Santa Elena Canyon or Castolon. Castolon is a small cluster of buildings on the site of a former Army post. You can buy some snacks and drinks for the hike here. Continue on the road to the end. There is ample parking at the very end of the road. Be forewarned that there are reports of car vandalism in the area, so you may want to time your visit when more people are around. 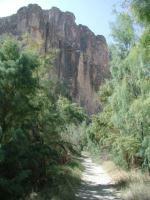 The Hike: This short trail follows the bank of the Rio Grande as it cuts through the Mesa De Anguila. 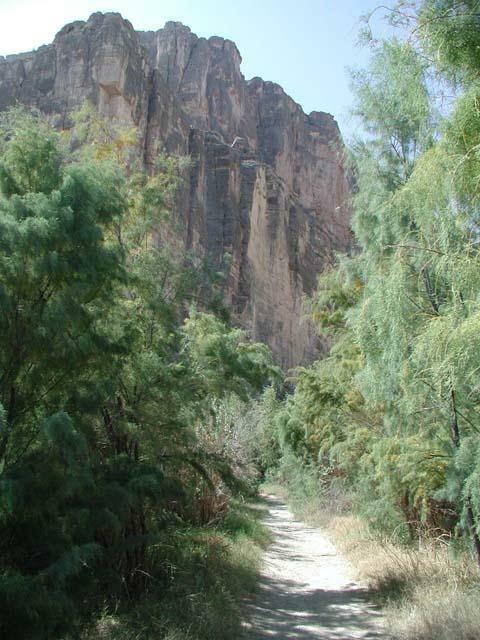 It's a short hike, but the stunning views in the canyon make this hike one of the top attractions of Big Bend. 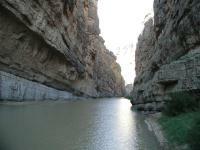 On the drive to the trailhead Santa Elena Canyon provides a stunning view. The trail starts off from the parking lot with the canyon clearly ahead. Given the close proximity to the river there is lush vegetation in the area, including some trees and plants that you will not find elsewhere in the park. 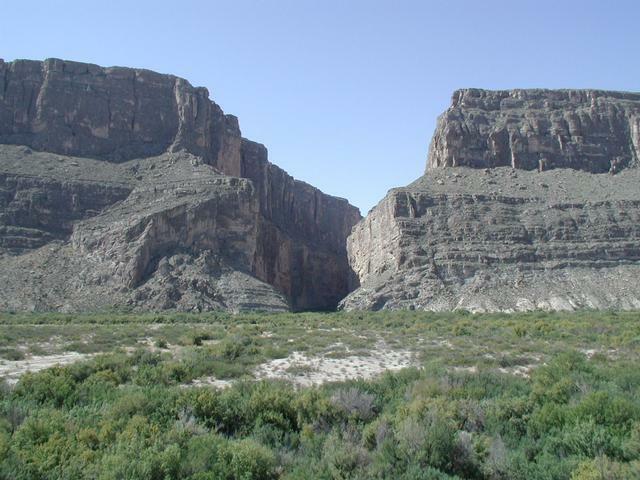 The waypoint "Creek Cross" marks the point at which the trail crosses Terlingua Creek. On our visit this creek was completely dry, so it presented no barrier us. However, if you visit during a wetter month pay close attention to this area as the creek may be too deep and swift for safe passage. The close proximity to the river makes the desert floor bloom. The Mexican side of the canyon looms ahead. Upon arriving at the mouth of the canyon there are a series of switchbacks in the rock at the spot marked with the waypoint "Steps". Many of the switchbacks are reinforced with concrete and some include hand railings, which makes the going much easier. When you reach the top of the switchbacks take a look back to the north and see the Chisos Mountains in the distance. Look across the Rio Grande and see Mexico a few hundred feet away. Depending upon the season in which you visit the Rio Grande may not look all that grand. It seems odd that the river carries enough force to have carved such a canyon. The secret lies in the fact that the mesa is constructed of limestone, a relatively soft rock and the Rio Grande is heavily loaded with sediments and sand, which act as an efficient scouring agent eating away at the rock. The Rio Grande riverbank includes sandy soils and lots of vegetation. The trail follows the Rio Grande upstream. The trail hugs a ridge in the canyon wall on the American side of the river. At the waypoint "Overlook" there is a fine spot to view the river both up and downstream. This is the point at which a lot of visitors turn around because the trail from here is rougher and harder to follow. While the trail along the canyon up to this point hugged a ridge, from here on out the trail will drop down closer to the river and follow a real river bank. Instead of bare rock you'll go through thick clumps of trees and bushes with dirt and sometimes sand under your feet. This narrow belt of life along the river plays host to a wide variety of plants such as Cane and Willow trees. 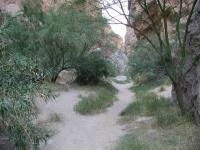 The trail ends with the canyon walls near vertical entry into the river. Animals also abound in the canyon, though it is too small of an area for large mammals. We spotted numerous exotic-looking bugs along the trail. One appeared to have white fuzz on his back and another sported green and black spots. The most numerous animal life you'll see on this trip however is the large number of birds that nest in the cliff faces overhead. The birds darted in and out of nests and flew up and down the canyon almost continuously through our hike. We stopped for lunch as the waypoint "Lunch Rock". Several large boulders jut into the river providing another excellent view of the Rio Grande. Here one can also see that the trail does not continue for much longer. The river bank ends in a abrupt rock wall that descends into the river too steeply to allow a river bank to take hold. The first part of the hike is climbing a number of stairs but you're too distracted by the great view to mind. 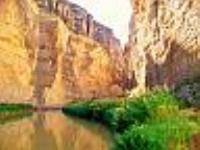 Once you reach the canyon you're treated to magnificent rock faces on each side of the Rio Grande. Kayakers finishing their Big Bend Rio Grand River trip pass by every so often to land near the trailhead. Great hike, lots of beauty with not much effort. Some elevation changes going in, but well worth the heat in July. We heard a few days before the mud was too deep to cross the creek but was dry the day we did it. You go up a huge staircase and then angle your way back down to the river. Fairly easy hike for anyone to do and well worth the effort!!! Santa Elena Canyon is one of my favorite places to visit. The trail is extemely easy to navigate and the rock walls are beautiful, raising as high as 1500 feet on each side. It has changed a bit since the flood and you can't go as far in the canyon on foot because huge boulders block the path now. Beautiful Canyon. Part of the trail is washed out.